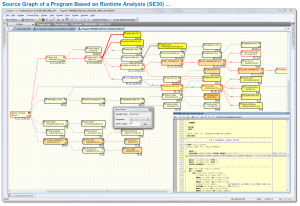 A graphical offline debugger additionally shows you the program flow as a process diagram. You can navigate step-by-step in this visual debugging (forwards, backwards, jump, …). You can even see the content of the variables being processed (see 2.2) for each step. In program development, it makes sense to check the program structure early in the various phases of development (for complexity, performance, use of existing modules, and so on). 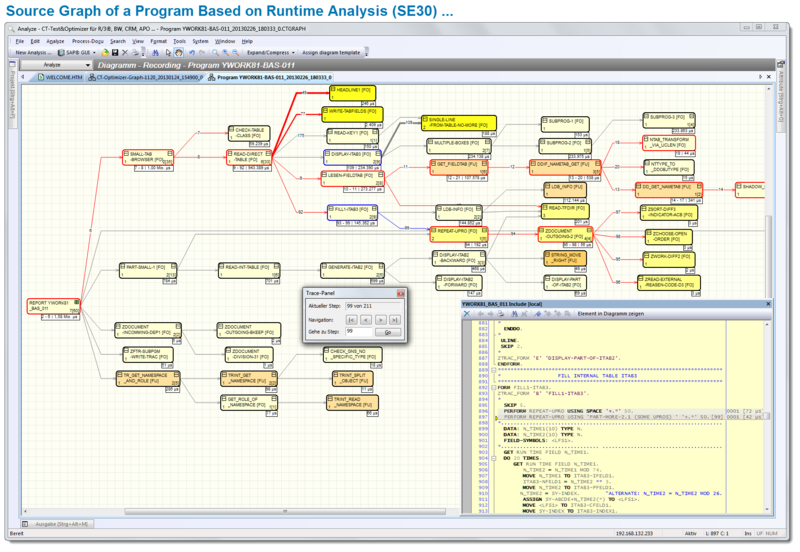 A graphic representation of the associated program test clearly shows the program flow processed. Further, the graphical trace recording helps to build up the program documentation piece by piece. The recording of the processed program modules (e.g. transaction SE30) is extensive and has not previously been represented in graphical form. An evaluation of the recording with supporting visualization reduces the complexity of the analysis. 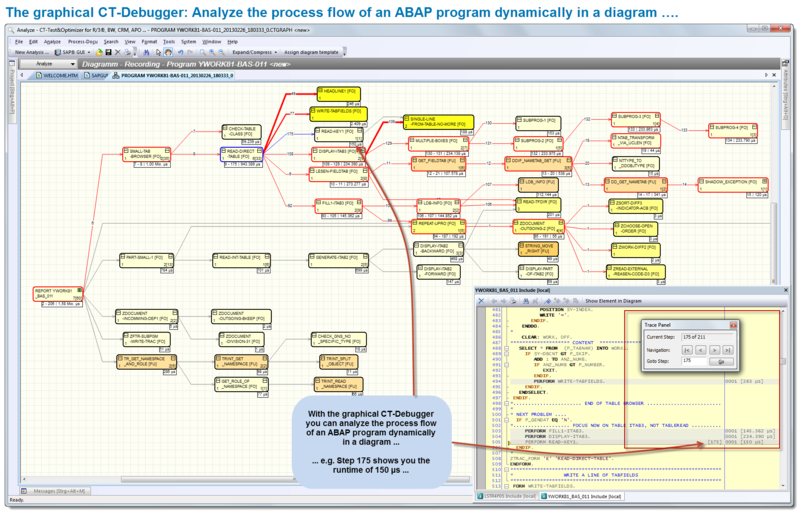 Analysis of processed ABAP programs/transactions in the conventional way via online debugging is relatively time-consuming and, as a result, costly. Trace recordings are currently not available within the ABAP Workbench. The exact program flow (e.g. dynamic control) can often be established only through a time-consuming debugging session. Here too, the CT-Test & Optimizer can provide substantial support to your project work. 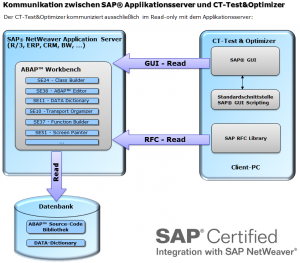 If, during program optimization, the focus is on the runtime of an ABAP program, it is sufficient to determine the processing times (SE30) of modularization elements (e.g. FORM, FUNCTION, and METHOD). If detailed program flow analysis is required, however, (e.g. correcting errors, enhancements, or maintenance), a trace recording up to the level of the commands being processed (CT-Trace data pool) makes sense. The CT-Test & Optimizer uses both the data from the runtime analysis (SE30) and the CT-Trace data pool..
2.2 Program flow analysis = CT-Trace data pool (CT-Debug & Trace_Modul). This control data forms the basis for analysis, routing, and visualization of the program flow. 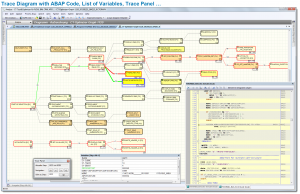 The result is a graphical overview of the processed program elements, contents of the variables, ABAP code, and statistical data. You recognize the most important processed program events and their interrelationships at a glance (FORM, FUNCTION, METHOD, DYNPRO, MODULE, CALL SCREEN, and so on). To perform program optimization, you need to import the recorded data with the processed times from runtime analysis (SE30); this import run is supported by the CT-Test & Optimizer. 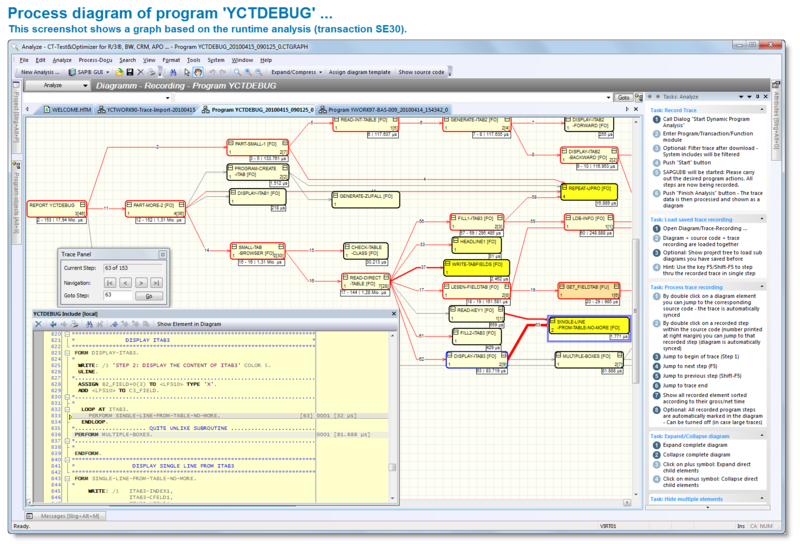 The graphical debugger (trace panel) shows you the processed program elements directly step-by-step in the diagram and can be used to do a rough analysis of the program flow. In addition, the relevant source code is shown in a pop-up window with consumption times. Double-clicking on a graphical element (FORM, FUNCTION, METHOD …) takes you to the relevant process step in the graphical debugger (trace panel). 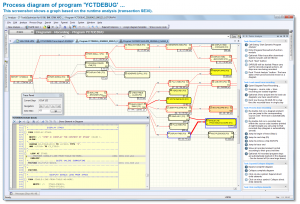 A trace data import from the CT-Debug & Trace module including the contents of variables is required for visual program flow analysis (not included in the delivery scope of the CT-Optimizer). The processed program steps (e.g. ABAP commands, command groups, breakpoint control) are recorded by the CT-Debug & Trace module and stored in the trace data pool. 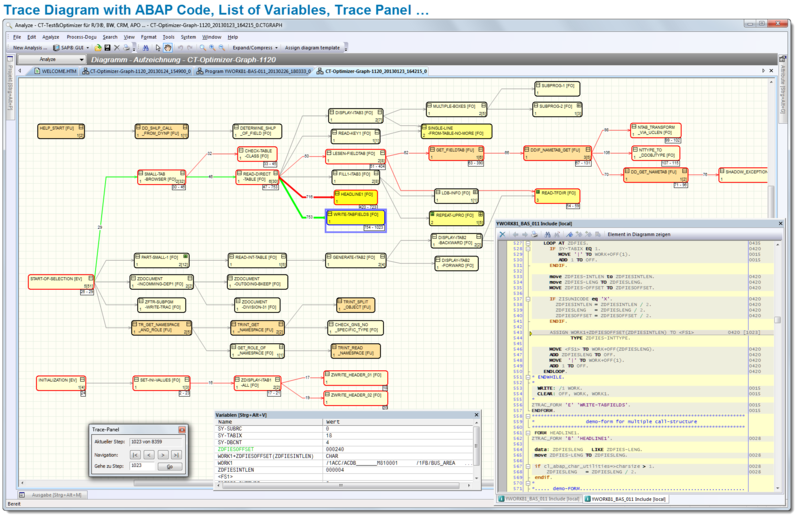 This control data is used for detailed analysis and forms the basis for routing and for the visualization of the processed program flow (trace diagram, ABAP code, list of variables, trace panel). Using this graphical representation, you can see the processed program events at a glance (FORM, FUNCTION, METHOD, DYNPRO, MODULE, CALL SCREEN, and so on). The processed variables and their current contents are shown in a separate window. This means that you can see the contents of the processed variables for each program step and can debug forwards/backwards as required. You can create process documentation based on the results of your analyses and so can share this information with other team members. The graphical debugger (trace panel) supports you in the subsequent visual process analysis and process documentation. You can display each program step in the trace pool step-by-step. As you do so, the relevant diagram element is selected. In addition, to provide context, the ABAP code is shown at the appropriate processed code position in a pop-up window. According to the task involved, you can select the method that best suits your purposes. 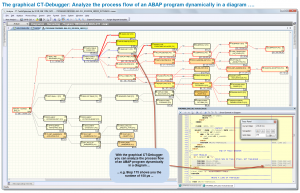 The usefulness of process documentation for an ABAP Program is frequently underestimated. IT practice shows that many ABAP programs are analyzed and evaluated several times by various developers/consultants (for the purposes of maintenance, error analysis, performance optimization, and so on). Process documentation translates temporary know-how into permanent information objects. 5. Which IT Areas Benefit from the Graphical Process Analysis? Which coding sections are assigned to which process? Are the processed coding sections suitable for the calling process? Can the processed program sections provide the required information? Has the program been correctly configured? Which data is available and when? Is there a clear call hierarchy? Are certain program events used very frequently? Which program parts block subsequent routines? Which time-critical program parts negatively impact on which transaction flow? 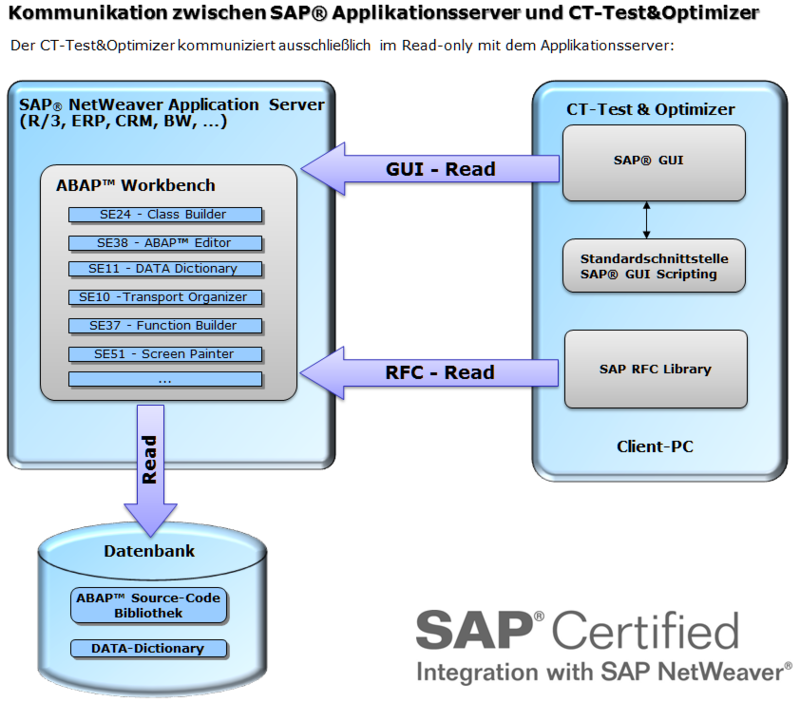 Communication between the ‘CT-Test & Optimizer’ and the application server is realized exclusively using certified standard interfaces of the company SAP SE, Walldorf. The CT-Test & Optimizer is suitable for the following SAP® systems: R/3® from Release 3.x to 4.7 inclusive (Enterprise), mySAP™ ERP, mySAP™ CRM, SAP® BW, and all other components that are based on SAP® NetWeaver® systems (up to 7.3). 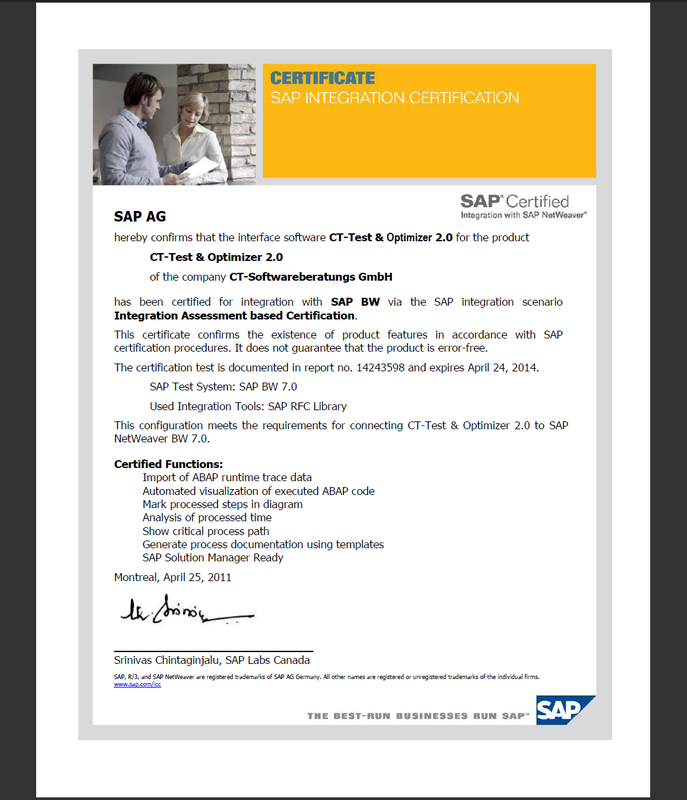 SAP SE certified the sofware solution ‘CT-Test & Optimizer’ 25.04.2011.